A portfolio of temporary work platforms manufactured by Easi-Dec Access Systems Ltd, a Kee Safety company: Easi-Dec, Mono-Dec and Solar Platform. Easi-Dec work platforms have been designed to deliver safe rapid access solutions for temporary work at height. 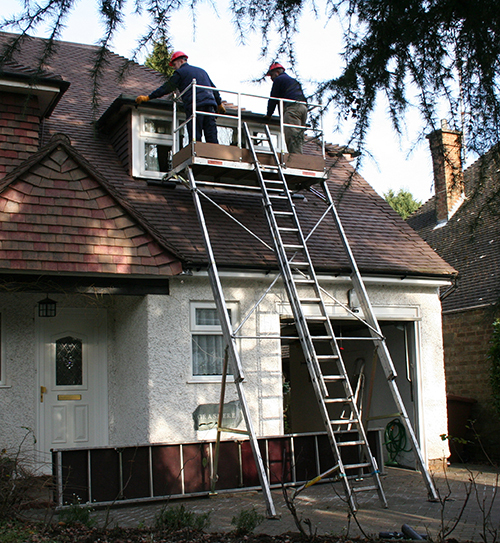 The work platforms are used extensively across many sectors for property maintenance tasks; window re-placement, roof and chimney maintenance and fascia, softfit and gutter repair. Flexibility and speed of installation are key criteria when considering access options, and the Easi-Dec range of work platforms provides both. Easi-Dec work platforms have been tested to European and North American standards. Easi-Dec is a work platform designed for two people, fully enclosed by a guardrail. The Easi-Dec platform provides safe, rapid access to roofline level, whilst spanning building obstructions such as porches and windows. Two or more Easi-Dec work platform can be securely linked with a Catwalk to form Roofline System. 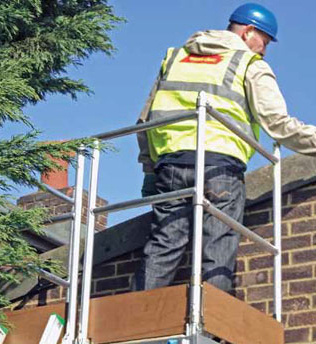 A work platform providing simple rapid access to roofline level for a single worker. The platform is ideal for task like painting, cleaning soffits or re-pointing brickwork. Mono-Dec can be extended by use of a Catwalk joining onto another Mono-Dec to form a Trimline System. A platform specifically designed to allow safe access up to roof level for solar panels installation, repair and maintenance. The platform incorporates a hoist facility and an opening in the floor of the platform to raise solar panels up to roof level. The platform can be extended by a Catwalk linking a Solar Platform and an Easi-Dec to form a Solar Access System.